Apple is doubling the size of its already-huge solar array at its data center in North Carolina, buying another 100 acres of land to house a second large installation of solar panels. The company said the expansion, along with its plan to use fuel cells from Bloom Energy, will allow it to supply 60 percent of the power requirements for its data center through on-site generation of renewable energy. "That’s a scale of onsite renewable energy production that no other company has matched," Apple said on an area of its web site dedicated to its data center energy sourcing. "On-site energy generation minimizes our dependence on the grid and reduces our environmental impact. And when our solar arrays and fuel cells are operating, Apple’s Maiden data center will be the most environmentally sound data center ever built." 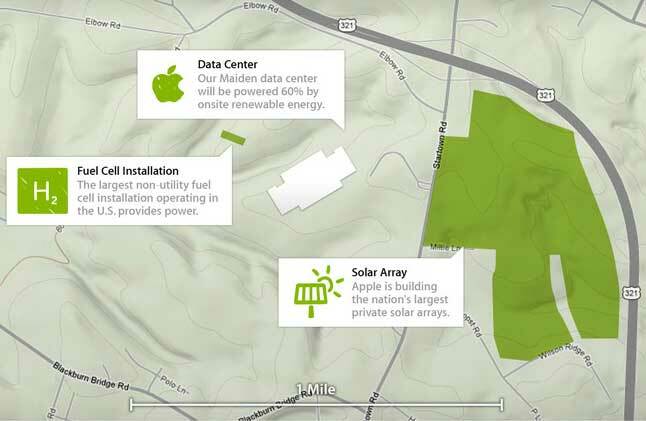 Apple says its generation facilities at the Maiden, N.C. facility will be producing enough on-site renewable energy — 124 million kWh — to power the equivalent of 10,874 homes. That includes two separate 100-acre solar arrays, which will each produce 42 million kilowatt-hours (kWh) of energy annually. Apple will also use biogas from nearby landfills to generate electricity using fuel cells from Bloom Energy, which will supply another 40 million kWh annually. Those three on-site generation projects will supply 60 percent of the 20 megawatts of power required to support the Maiden iDataCenter, Apple said. "We’ll meet the remaining 40 percent of our energy needs by directly purchasing clean, renewable energy generated by local and regional sources," the company said. The announcement was welcomed as a step in the right direction by Greenpeace International, which has been highlighting its concerns about Apple's energy sourcing in a series of demonstrations and blog posts. “Apple’s announcement today is a great sign that Apple is taking seriously the hundreds of thousands of its customers who have asked for an iCloud powered by clean energy, not dirty coal," said Gary Cook, senior IT analyst at Greenpeace. "Apple’s doubling of its solar capacity and investment in local renewable energy are key steps to creating a cleaner iCloud." Cook said Greenpeace would continue to pressure Apple to make a deep commitment to renewable energy. "Apple must adopt a firm siting policy to prioritize renewable energy when it chooses locations for new data centers," he said. "Only then will customers have confidence that the iCloud will continue to get cleaner as it grows." That would follow the lead of Facebook, which in December Facebook agreed to prioritize the use of renewable energy for its data centers, prompting Greenpeace to suspend a social media campaign that targeted the social network. On Monday Cook addressed data center professionals at the annual Uptime Symposium, and said its activism targeting Apple and Facebook was designed to prompt the industry to wield its power to alter the energy paradigm. "You have a role to play," said Cook. "The people in this room could be leading the change to the clean energy economy. It's very important that this sector commit to a sustainable path. "We need you to look at your supply chain," Cook continued. "You have huge buying power. You have the opportunity to shift the marketplace and demand cleaner power from your utilities." Most data center operators have focused on efficiency as the best way to reduce their carbon impact, rather than seeking to influence or reform local utilities. Greenpeace has responded with sharp critiques based almost entirely upon whether power is sourced from coal. Cook noted the frequent references at the Uptime conference to lower Power Usage Effectiveness (PUE) ratings, a benchmark for energy efficiency. "PUE is a very useful metric and diagnostic tool, but it is not a good indicator of how green you are,"Cook said. "It does not speak to the resources you use in the outside world. We need to have greater transparency." Apple has stepped up on the transparency front as well, saying it will register the renewable energy generated by our solar arrays and fuel cell installations with the North Carolina Renewable Energy Tracking System (NC-RETS) established by the North Carolina Utilities Commission. Apple's super-sized commitment makes it the third major data center firm this week to unveil an expanded use of solar arrays, with others including DuPont Fabros Technology and QTS (Quality Technology Services).